Sony is Trying to Trademark The Term Let’s Play? No, we’re not making this up. Sony has recently filed a trademark request for the term ‘Let’s Play’, with the definition being given as ‘Electronic transmission and streaming of video games via global and local computer networks; streaming of audio, visual, and audiovisual material via global and local computer networks’. Above: You can view this application by clicking on either the screenshot above or this text. So what do we think about this? Well for starters, we strongly doubt that this will be accepted as a trademark, since it’s clearly trying to take ownership of a term that’s commonly used as generic by a large community. So there’s a pretty good chance someone will object to it, perhaps even one of Sony’s direct competitors (since both Nintendo and Microsoft have used the term for their own videos and what not). Either way, Sony has tried to trademark the term ‘Let’s Play’, and you should really hope they don’t succeed with their application. I would like to update on that now. 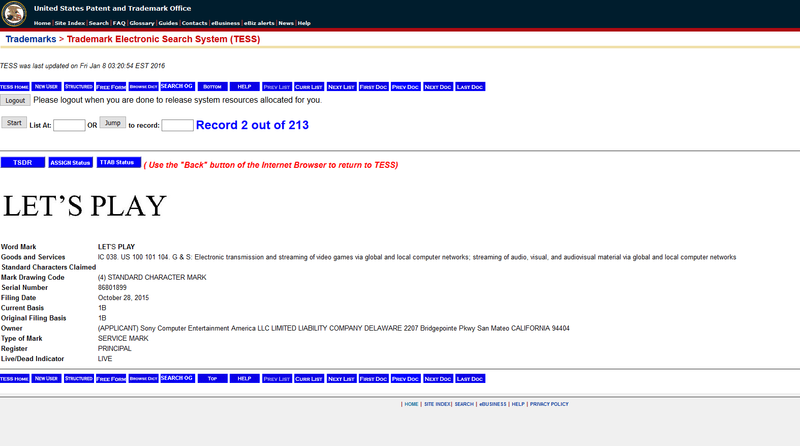 The USPTO just recently rejected Sony’s trademark request, as the term “Let’s Play” is “merely descriptive”. So Sony has failed… implying they had any chance with this to begin with. A bold move, though Sony is on top right now and this could shake their fanbase badly. Yeah, it's a really bad time to start making stupid trademark claims. You've got a successful console in the PS4, don't jinx it. Yep. Unfortunately for Sony, their fanbase are not the kind to be ignorant of patent trolls. [QUOTE="CM30, post: 4096, member: 1"]Yeah, it's a really bad time to start making stupid trademark claims. You've got a successful console in the PS4, don't jinx it.